Sunlight is the most important consideration. While most vegetables can get by with a minimum of six hours of sun per day, more is better. Take a walk around your yard. Watch how the sun moves across it, paying particular attention to areas of shade from your house or other structures, trees and hedges. Plant roots need to grow without running into obstructions. That’s another good reason to locate your garden beds away from trees or hedges because you’ll be fighting their roots. If you plan to grow your veggies in containers, look for a sunny spot to locate them. Some folks place their pots on casters so they can follow the sunshine by moving them around. Another consideration for site selection is the availability of water. If you’re continually having to drag hoses to your garden spot, it will become a chore and you’ll run out of enthusiasm in short order. Make sure a faucet is close by or have a dedicated hose that’s always in the garden and ready to use at a moment’s notice. 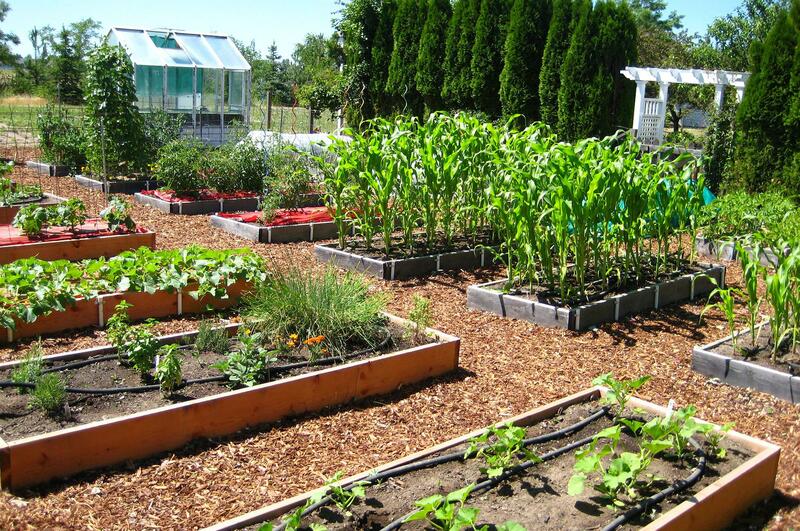 I grow my vegetables in raised beds and water them with drip irrigation. It works great but if that doesn’t fit into your budget or plans, there are simpler set-ups to consider. Soaker hoses are reasonably-priced alternatives that deliver water at the soil surface, cutting down on evaporation. Gardens need to be watered regularly yet those watering chores often take a back seat to everything else. Consider purchasing an inexpensive, automatic watering timer to attach to the faucet. That way, the garden gets watered while you take care of other things. The type of soil in your garden will impact how often you have to water. Sandy and clay soils are the most challenging. If your soil is granular and water runs right through it, you’ve got sandy soil. If it’s dense, sticky and doesn’t drain well, it’s clay soil. The great news is that each of these can be improved by adding compost to the soil. It will slow the flow of water through sandy soil and break up the dense quality of clay. The goal is to strive for crumbly soil, if possible. This time of year, it’s important to avoid working with your soil while it’s wet. To determine this, grab a handful of it and squeeze. If you just made a mud pie or it’s clumpy, it’s too wet. If it crumbles apart easily, you can safely work with it. Working with wet soil damages its structure, affecting how water, nutrients and soil organisms move through it. I learned this the hard way many years ago and have been careful not to repeat that mistake. While predicting Inland Northwest weather is challenging, there are a few guidelines gardeners should be aware of. This region is in USDA hardiness zones 5 and 6. Our growing season has an average of 120 frost-free days, with the last frost being around mid-May and the first frost in mid- to late September. Keep this in mind when purchasing seeds or plants. Learn more about the above considerations in this week’s “Everyone Can Grow A Garden” video, which you can find on my YouTube channel, www.youtube.com/c/susansinthegarden. Susan Mulvihill is co-author, with Pat Munts, of “Northwest Gardener’s Handbook.” Contact her at Susan@susansinthegarden.com and follow her on Facebook at facebook.com/susansinthegarden. Published: Feb. 25, 2017, 7:30 a.m.